THE pink-combed smoke-grey gang-gang cockatoos nesting in a hollow high up in a brittle gum – Eucalyptus mannifera sub-species mannifera – in Mayday Hills’ grounds above Beechworth are harbingers of the tree’s importance. It is, as the National Trust’s Victorian division describes it, the only one of its kind listed in its significant tree register since the collation of its statewide inventory began. The trust’s environmental heritage advocate Anna Foley says that the tree has achieved recognition at a state level because it is an “outstanding example” of age, size, aesthetic appearance and contribution t the landscape. That it stands in a historic garden and is a remnant of the woodland that almost certainly grew here before European settlement only adds to its value to the state. 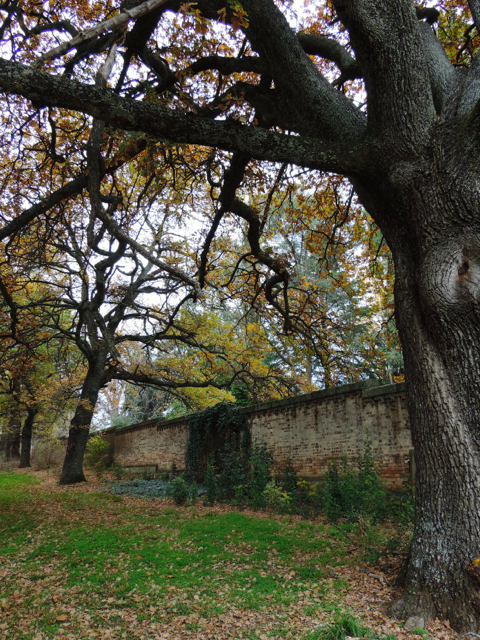 The trust in March 2014 agreed to add – for their aboricultural significance to Victoria or to the North East – 62 trees or tree groups at the former asylum known as Mayday Hills and what became, until it was sold last year, La Trobe University’s campus. The hard ‘sleuthing’ to plot and to identify the trees was carried out across 18 months by Beechworth Treescape Group volunteers – Dave McIntyre, Harvey Anderssen and Vivienne Harvey among them. Dave and Harvey, setting a brisk pace among the site’s most significant trees on a drizzling Monday morning, are human encyclopedia of Linnean nomenclature. The names of numerous oak species planted in the park roll off the pair’s tongues – Quercus alba, robur, acutissima, canariensis, leucotrichophora and palustris. A double planting of Quercus robur – the English black oak – described by the trust as “one of Victoria’s most aesthetically pleasing driveway avenues, especially for its species” numbers 25 trees. It has been listed for its significance to the state. There are also rare maples – Acer oblongum (known in common terms as a Kashmir or Himalayan maple), opalus sub-species obtassatum (Italian maple) and palmatum (Japanese maple). An 11-trunk Chamaecyparis lawsoniana Lawson’s cypress has been included for its state significance because – while comparable in height to another of the same species on the trust register and growing at Narbethong – it has a larger spread and circumference. The park is also home to an Araucaria bidwillii Bunya bunya pine planted in the 1870s by an inmate and gardener of what was then the Mayday Hills’ lunatic asylum. The trust says that it is “likely the largest trunk circumference Bunya pine in Victoria”. Anna Foley says that the treescape group’s efforts to catalogue Mayday Hills’ trees had been outstanding. “I presented Mayday Hills as an exemplary study during a talk on significant trees, explaining that without community volunteers, neither the trust nor the Indigo Shire (Council) would be in a position to protect the most individually-significant trees on the site,” Anna wrote to group secretary Vivienne Harvey. The National Trust has a ‘Trust Trees’ app for mobile telephones and iPads so that people can explore more than 1200 significant trees in Victoria. The Mayday Hills’ trees will soon be shown among them. Beechworth Treescape Group conducts tours of Mayday Hills’ trees and gardens.